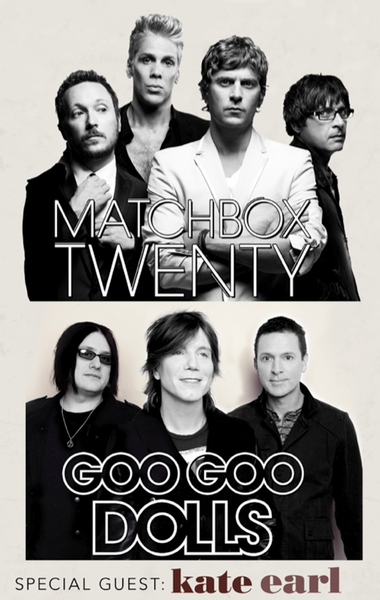 Tomorrow - June 11th - a handful of newly added shows on the Matchbox Twenty & Goo Goo Dolls Summer Tour will be included in a Fanclub Exclusive Pre-sale at 10am local venue time. Remember, because you're a fan club member - you get first access to pre-sale tickets. You DO NOT need a pre-sale code to get tickets for these shows. You simply need a valid membership to the Matchbox Twenty Fan Club. BONUS: Over the course of the tour 10 random Diamond Ticket Package purchasers will be selected to participate in soundcheck parties.